What the hell is in movie nachos anyway? They don’t really taste like cheese, but they are all creamy and warm and spicy. A collection of adjectives that are very attractive! So how can we get all that in a raw food, vegan recipe for cheese? No worries my movie-loving friend. 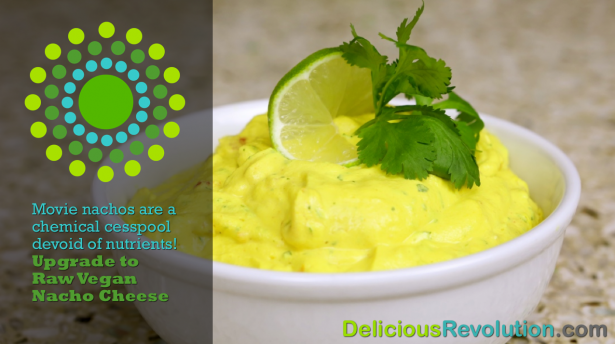 The video below shows you how to whip up a batch of this raw vegan nacho cheese. Use your mandolin to make some chips from fresh veggie chips and snack away. This recipe is best with raw macadamia nuts soaked for 8-10 hours, rinsed and drained, but roasted. Dry nuts also work. Blend nuts, turmeric, cayenne, salt, water, and fresh lemon juice in the Vita-Mix until creamy. The mixture warms as it blends. Add extra water if you prefer a thinner consistency. Stir in fresh salsa to desired spice level. Go on a two week raw food cleanse adventure with Chef Joy Houston as your guide. Day by day, meal by meal, video by video she supports you through a two week raw food detox that will get you looking and feeling your best. What will you feel like in your Rocking Body? I love finding new vegan recipes! I especially love how much more common it is now a days. I’ve been looking for a vegan protein powder, maybe someone could help me out! Has anyone ever tried Sunwarrior http://www.mynaturalmarket.com/Sunwarrior-Protein-Raw-Vegan-Vanilla-Gluten-Free.html ? If so what’d you like and not like about it? I love their powders- my favorite is the blend (cranberry, hemp, ect). The upside is the texture is way better than ANY I’ve tried. Hi, even though not new to raw foods (and fasting) it is my desire to learn more. I just wanted to give a tip on macadamia nuts from last nights shopping experience. Since I recently came off an 8 day master cleanse, I was sampling all the raw nuts before I bought them (taste so good!) and low and behold, the mac’s had a very off taste to them. Used to be when I saw people taking tastes off the bulk containers I chalked it up to freeloading. Now I am going to try every one before plunking down $13+ for a pound of rancid nuts. Even had another person try them (just to be sure) and after she pulled them and she wrinkled her nose at them as well and left them on the counter. Thank you Joy for your recipes, I got a batch of kale chips in now for the first time. model number of the blender you use?